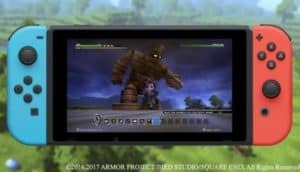 Dragon Quest Builders Coming To Nintendo Switch | Nerd Much? The Nintendo Switch version will have exclusive "experience and items." Though Dragon Quest Builder has been on the PS3, PS4, and PS Vita for two years, it is now coming to the ultimate portable console, Nintendo Switch. The launch date is set for February 9, 2018, no word on the price yet. For those that have no idea what Dragon Quest Builder is, it is a sandbox RPG spin off of the much larger Dragon Quest series. Dragon Quest is the open world more fully JRPG version of Zelda. That open world is what sets Dragon Quest apart from most games like it, offering plenty for the player to discover. This game also includes a free-build mode called Terra Incognita. It is not multiplayer, however, like Minecraft, but you can upload your creations and share it with other interested players. If you happen to like what someone else built, you can download there buildings and set them up as your own. Fans of Dragon Quest Builders are sure to be thrilled by the port to the Nintendo Switch. The portability of the console has been a selling point from the start, seemingly regardless of the downgraded quality of the game. Doom, for example, is significantly worse graphically and runs at 30fps instead of 60fps. Most gamers were ecstatic to have Doom on the go and didn’t care one wit what the fps was or what the depth of field was.